Cantor Fitzgerald’s second annual Global Uranium Conference featured a lineup of noteworthy uranium companies. Following the event, the Investing News Network had a chance to catch up with senior analyst Rob Chang to get a rundown of how it went. Cantor Fitzgerald’s second annual Global Uranium Conference, held in New York on June 4, featured a lineup of noteworthy uranium companies, from global producers to explorers. Following the event, the Investing News Network had a chance to catch up with Senior Analyst Rob Chang to get a rundown of how it went. He said in general the sentiment of attending companies was positive, which is refreshing considering the current uncertainty in the market. “Everyone was pointing to the upcoming supply/demand deficit — when it is going to occur and how they are positioning themselves for that recovery. Depending on who the company is, they may be more conservative than others, but generally speaking it is about managing the businesses properly in advance of future growth,” Chang explained. Companies at the conference estimate that a uranium deficit will come sometime in the early 2020s, while analysts think it will happen between 2018 and 2021. While nobody can predict exactly how high the uranium price will get when the deficit does come, Chang said he expects an increase similar to what was seen in the mid-2000s. According to Cameco (TSX:CCO,NYSE:CCJ), one reason a deficit is expected is that US utilities’ requirements are expected to open up after 2016. Corroborating that claim, speaker Scott Melbye cited US Department of Energy data that shows that US utilities’ requirements will be “substantial” in 2017 and 2018. Even today he said he is seeing many US utilities — and their counterparts in Europe and Asia — in the market for spot uranium. Looking at exactly how much uranium will be required when the deficit hits, Cameco said that the world will need four more Cigar Lakes. That project is expected to produce 18 million pounds of uranium annually at its peak, and at this point no other projects come close. That said, Chang pointed out that considering the cost of producing in Africa, the uranium price would need to reach the $80 mark in order for miners to turn a profit there. On a different note, Melbye highlighted a few geopolitical events that could have a significant effect on the uranium market. 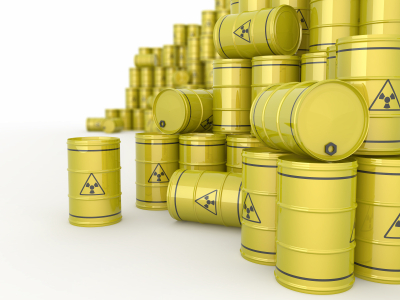 For instance, Russian sanctions, which until now have mostly affected oil and gas relationships, are now shifting closer to the nuclear fuel market. Then there is Islamic extremism, which is impacting Niger, the fourth-largest uranium producer. Al Qaeda-inspired Tuareg rebels operating in the Southern Sahara have attacked Areva’s (EPA:AREVA) operations there, and employees have been killed and kidnapped. Aside from that, Chang believes one of the scarier issues is the possibility of Russia “decid[ing] to become imperialistic and take Kazakhstan, like they have effectively done with Crimea and the Ukraine. That would be a huge issue if that actually happened. Will it spark something bigger is going to be a key question and an interesting question because both China and the US would definitely care,” he said. As mentioned, the presentation schedule at the conference was packed with promising exploration companies as well as producers, and a post-conference summary from Cantor Fitzgerald provides a rundown of what they all highlighted during their talks. Another notable company is Uranium Energy (NYSEMKT:UEC), which recently expanded the boundaries of its Palangana mine. The company is also advancing its Yuti ISR project in Paraguay from the exploration phase to the exploitation phase. Cameco of course also presented at the show, highlighting that it’s reached official commercial production at Cigar Lake. Fission Uranium was another presenter, and considering all the promising drill results the company has released in recent months, it had plenty of strong points to talk about at the conference. Ur-Energy (TSX:URE,NYSEMKT:URG) highlighted its recently announced resource update, which yielded a net increase of 2.498 million pounds, and said it will be following up with another update on the resource in either the third or fourth quarter. Other companies that presented were Denison Mines, Uranium Participation (TSX:U) and Paladin Energy (TSX:PDN,ASX:PDN).